Australia is suffering from a heatwave with some regions reaching almost 50 °C. Meanwhile in Tasmania they are experiencing the worst wide fires since 1967 when fire took the lives of 64 people. The fires are in the Houn valley, Gell River area and the Central Highlands. and the fire fronts cover around 1000 km. The cause of the fires was an unusual amount dry lightening, 2500 strikes. Such a phenomena has not been see since 2016 and is very unusual for Tasmania. The island's fire crews are getting help from the mainland and New Zealand to tackle the fires and there is talk of help coming from the US. Red markers show emergency warnings, yellow markers are watch and act, and blue markers mean advice. 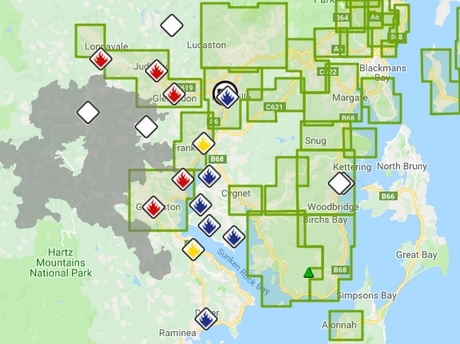 Phil Pyke formerly CEO of Fruit Growers Tasmania and longtime fire service volunteer said that although there has been no damage to properties as yet, there are restrictions in place and people have been evacuated. the town of Geeveston is almost completely surrounded. The fires are presenting challenges for fruit growers in the Houn valley. "Some of the local staff are out fighting the fires and others have been evacuated or are out protecting their own properties. Some pickers are also staying away from the area due to the dangers. Some of the orchards further up the Houn Valley are directly under threat," according to Phil. "Across the Houn river there are also some restrictions on movement, which may cause logistical problems. Growers in the region produce cherries, but the harvest is over so the fires should not affect exports. I want emphasis that most growers in the Houn valley are not affected. Some apple producers are still packing last year's crop and the fire will present challenges. "These fires are not like anything we have seen before, it's moving unlike a typical Australian bush fire, moving very slowly and much of it's in inaccessible country people can't get to it."